This pedal is part of the “Tone-Lok” series from Ibanez, a company who has gained a certain respect from effect users for the Tube Screamer and some of its variants. This is a distortion unit, too, but forget about the Tube Screamer: this is more aggressive and geared for modern rock sounds, think Drop-D tunings and 7 strings guitars. Apart from the usual controls there are two switches: “Void” and “Edge”. The first one is actually a noise gate with three settings: “off”, “1″ which means longer decay while “2″ means shorter decay. 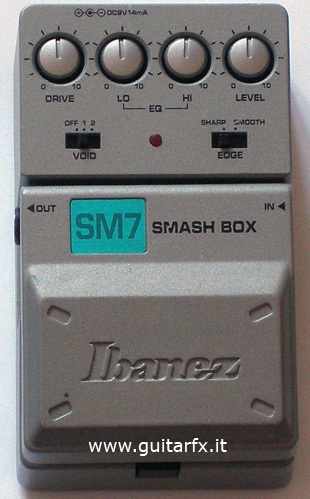 The second switch has two positions: “Sharp” and “Smooth” to select high frequencies boost or cut.